Good thing there were neighbors to stop him. This is a picture of Harper. Harper and I are not friends. We just met yesterday. 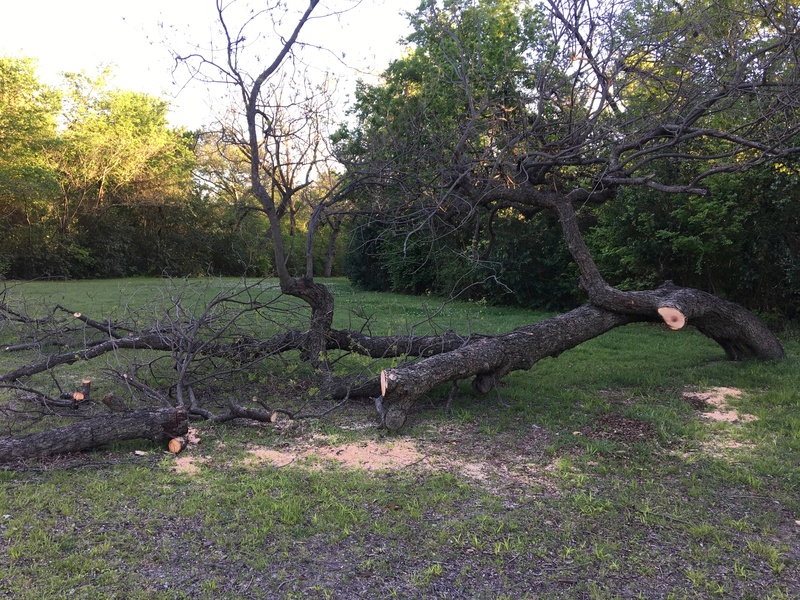 But we both love an old tree that grows in our neighborhood, which is near the intersection of Lake Highlands and Peavy streets. It’s a strange pecan tree that is fun to climb on because it leans way over and touches the ground. Some people in our neighborhood say that the old pecan is an Indian marker tree. An Indian marker tree is a tree that people used a long time ago to find their way or remember where something important is. They should probably be called Native American marker trees. I met Harper on my way home from work yesterday. Driving by the old pecan tree, I saw a bunch of cars pulled over by the side of the road. People were stopping to look. The tree had been chopped up. All the people were very sad, including me. Harper put a Band-Aid on the tree to help it get better. Later, I learned what had happened. Late in the afternoon, a neighbor named Tina saw a man cutting up the tree with a chainsaw. 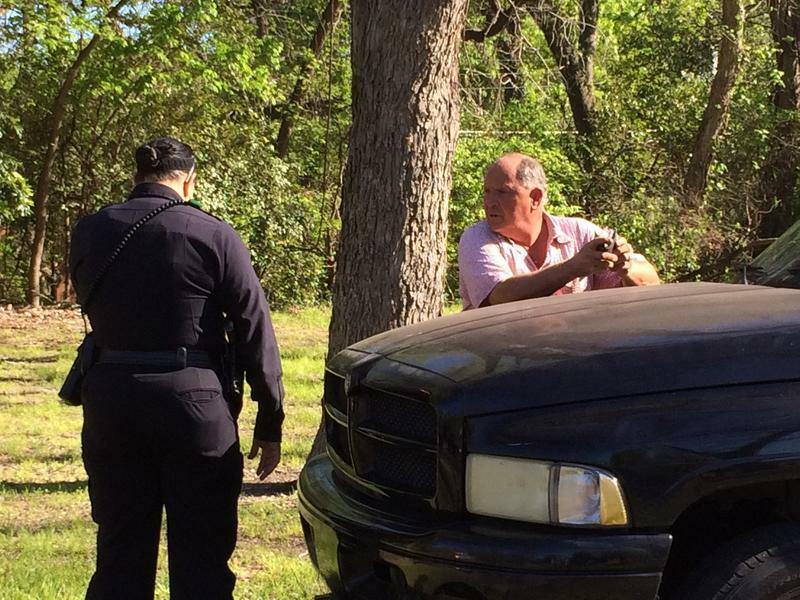 The man was loading the pecan wood onto a trailer attached to a Dodge pickup truck that he had parked near the tree. Tina told the man that what he was doing was illegal. The man was not nice to Tina. She called the police. A neighbor named Tom came along and used his car to block the man’s pickup truck so that he couldn’t drive away before the police came. Tom is a hero. A neighbor named Amy wrote about all this on our Nextdoor group. Nextdoor is a thing on the internet that can be a real pain in the neck. But sometimes it is very useful. This is one of those times. It shows what neighbors can do when they work together. Eventually five police cars came to the old pecan tree. The man told the police he had permission to cut up the tree, but the man was lying. A city forester named Karen Woodard came to help. A forester is someone who loves trees and takes care of them. Karen’s last name is perfect for her job. She called a man named Russell Hooper, who is a district supervisor for the Parks Department. Russell is also a hero, because even though he was on vacation, he hurried right over to the old pecan tree. This is the man who cut up the tree, before the police took him to jail. The police had never had to handle something like this before. They were confused. But some of them lived in the neighborhood and knew how important the tree was. Russell told the police that the tree was worth at least $10,000, even though I think the tree is priceless. But $10,000 is important because under the law in Texas, that means the man can be charged with criminal mischief at the state jail felony level. That means it’s very serious. The police handcuffed the man and took him to jail. I don’t know the man’s name yet. I will have to ask the police to tell me, using something called an open records request, which is a complicated way of saying, “Pretty please?” But I can tell you that the Dodge pickup truck belongs to a man who lives in a city called Red Oak. It is ironic that a man who illegally cuts up trees would live in a city called Red Oak. Even more ironic: the man lives on a street called Pecan Court. We’ll have to talk about what “irony” means later. As for the tree, no one knows yet whether it will live or die. Some tree experts will have to come look at it and see what they can do. For now, the old pecan tree only has Harper’s Band-Aid to help it feel better.